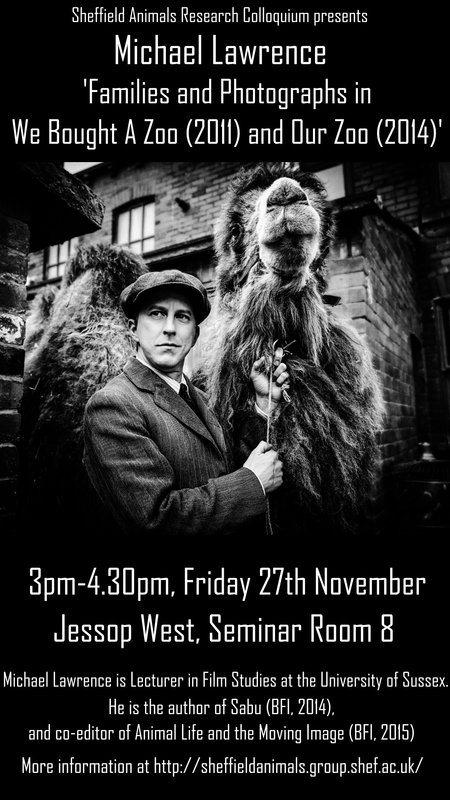 Sheffield Animals Research Colloquium warmly invites you to attend our next research seminar, which takes place in Jessop West Seminar Room 8 from 3pm-4.30pm on Friday 27th November. This presentation will examine the function of photographic images, practices and technologies in two recent family-oriented representations of family-managed zoos, the Hollywood feature film We Bought A Zoo (Cameron Crowe, 2011) and the BBC television series Our Zoo (2014), both of which are based on true stories. Drawing on the work of Marianne Hirsch (Family Frames, 1997), I will analyse the function of the ‘family album’ in these ‘feel-good’ entertainments, in which the opening or reopening of a zoo serves a thoroughly therapeutic experience for the family involved. The focus on the well-being of the human family functions to distract viewers from what Lisa Uddin (Zoo Renewal, 2015) has called ‘bad zoo feelings,’ the despair or disappointment so often experienced when animals are exhibited to the public. And as zoos increasingly utilize photographs—both official and amateur—to promote their activities, via digital applications such as Flickr and Instagram, this presentation will also address the problematic correspondences between zoos and photographic technologies—from slideshows to screensavers—exposed by my case studies. Michael Lawrence is Lecturer in Film Studies at the University of Sussex. He is the author of Sabu (BFI, 2014), the co-editor, with Laura McMahon, of Animal Life and the Moving Image (BFI, forthcoming 2015) and the co-editor, with Karen Lury, of Zoos and Screen Media: Images of Exhibition and Encounter (Palgrave Macmillan, forthcoming 2016). His articles have appeared in Screen, Adaptation and Journal of British Cinema and Television. He is currently researching the resourcing and representation of cattle in Hollywood westerns.